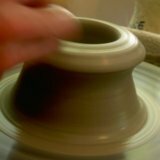 Pottery Glaze Mixer. This one piece of pottery equipment has made glazing my clay pots so much easier and more efficient. This tool has also saved my wrists for unnecessary wear and tear. 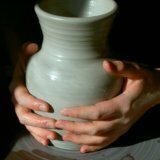 I used to stir, and stir, and stir my ceramics glazes until my wrists were sore. Now, I plug in the drill with the mixer attachment and mix away. Mixer Attachment - A cluster of blades or paddles that connects to an ordinary power drill by a long rod. 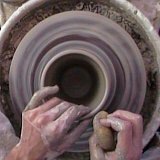 The mixer is placed into glaze or slip and spins, much like a kitchen mixer, saving the potter tons of stirring and scraping. My favorite type is a simple plastic cage like this Hyde mixer on the left. It works great for digging up heavy sediment off the bottom of the bucket. It's designed for 5 gallon buckets, and the plastic doesn't damage the bucket like some metal ones can. The thing about glazes is that they tend to settle heavily in the bottom of the bucket. The minerals that settle out stick together to form a sort of hard pan that is really difficult to break up. A mixer does this in a matter of minutes. Go back to Pottery Equipment page. 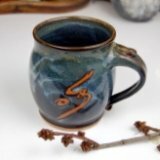 Go from Pottery Glaze Mixer back to Pottery on the Wheel home.